For the village in Burkina Faso, see Konkan, Burkina Faso. "Concan" redirects here. For Concan, Texas, see Concan, Texas. Konkan, also known as the Konkan Coast or Kokan, is a rugged section of the western coastline of India. It is a 720 km long coastline. It consists of the coastal districts of western Indian states of Karnataka, Goa, and Maharashtra. The ancient Saptakonkana is a slightly larger region. According to some Hindu Mythological legends, Parashurama shot his arrow into the sea and commanded the Sea God to recede up to the point where his arrow landed. The new piece of land thus recovered came to be known as Konkan meaning "piece of earth", "corner of earth" or "piece of corner": koṇa (कोण, corner) + kaṇa (कण, piece). This legend has been mentioned in Sahyadrikhanda of the Skanda Purana. The precise definition of Konkan varies, it is roughly the land between the Western Ghats and the Arabian Sea, and between the Tapti River in the north and the Chandragiri river in the south. The financial capital of country and Maharashtra state capital Mumbai: Mumbai city, Mumbai suburban fall in Konkan. 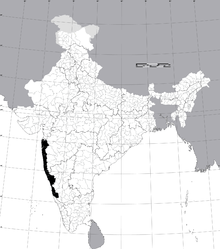 It includes the following districts of modern India: Thane, Mumbai (Mumbai city, Mumbai suburban), Raigad, Ratnagiri, Sindhudurg, North Goa, South Goa, Uttara Kannada, Udupi District and Dakshina Kannada. Mumbai and Mangalore form the 2 end points of the Konkan coast. 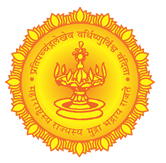 The Konkan division is an administrative sub-division of Maharashtra which comprises all the coastal districts of the state. The Sahyadri Mountain range ("Western Ghats") forms the eastern boundary of the Konkan, and the Arabian Sea marks the western boundary. The southern boundary is the Gangavali River. The Mayura River forms the northern boundary. The Gangavali flows in the district of ("Uttara Kannada") in present-day "Karnataka State"; the cis-Gangavali portion (seen from Mumbai) of this district is the southernmost part of the Konkan. The towns of Karwar, Ankola, Kumta, Honavar and Bhatkal fall within the Konkan. The exact identity of the Mayura River, the northern limits of the historic Konkan, is indeterminate. 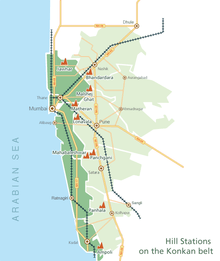 This is a schematic map of the Konkan belt (Maharashtra) with the hill stations plotted on it and how they are connected with roadways and railways. Konkan is a coastal strip of land bounded by the Sahyadri hills on the east and the Arabian Sea on the west. Maharashtra's Konkan area consists of Raigad, Ratnagiri, Sindhudurg and Thane districts. Some of the ethnic groups and communities found in the region include Agri, Koli, Bhandari, Gabit, Chitpavan, Gauda, Kudaldeshkar Saraswat Brahmins, Kuruba and Kunbi. Tribal communities in Konkan include Konkana, Warli and Kolcha in Southern Gujarat, Dadra and Nagarhaveli and Thane district of Maharashtra. Katkaris are found more in Raigad and also some in Ratnagiri district. Wikimedia Commons has media related to Konkan.